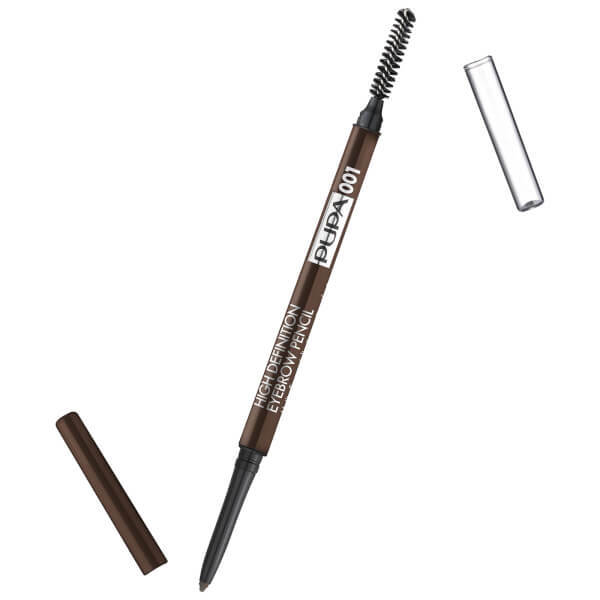 Create enviable arches with the PUPA High Definition Eyebrow Pencil; a dual-ended tool with an automatic brow pencil and a spoolie brush for combing and taming. Combining innovative film-forming agents with a perfect blend of waxes and pigments, the precision pencil applies effortlessly to deliver waterproof, natural-looking colour with long-lasting results. Create sculpted, expertly defined brows without risk of smudging. Diisostearyl Malate, Triethylhexanoin, C20-40 Acid, C20-40 Alcohols, Polyethylene, Synthetic Wax, Glyceryl Behenate/Eicosadioate, Ethylene/Propylene Copolymer, Ethylcellulose, Boron Nitride, Vp/Eicosene Copolymer, Tocopherol, Ascorbyl Palmitate (+/-) May Contain: Ci 77019 Mica, Ci 77891 (Titanium Dioxide), Ci 77491, 77492, 77499 (Iron Oxides).